Toadie telling Stu they are no longer mates- Serena finding out that Luka is her brother. Summer telling Max that Boyd jumped into Travis' ute. Travis picking up Boyd's mobile and hearing Stu. Stu hurriedly scans the streets looking for any sign of Boyd. Stu continues to search for Boyd and upon hearing a message about a Glenn Street, speed off towards that direction. Boyd notes that Travis has a good aim – much like when he threw the Molotov cocktail into his home. He looks stunned for a moment, not knowing what Boyd is referring to. Boyd tells him that he doesn't own the streets and not him, or Steve from the Council can stop him from putting up posters. They all continue to pelt food at him. Max blames himself for the situation, after all had he not grounded Boyd than he wouldn't have broken up with Sky. Summer knowingly says it's not his fault and that they were going to break up anyway – she could see it coming for a long time. The Bishops crowd around Lil and Luka as they both gingerly ease themselves onto the couch. Luka tells Serena she has hardly said hello yet, so she tensely greets him. Harold brings over the carrot juice for them and says that Karl left a dietary list and that a community nurse will come to check on Lil. David goes over to Luka, letting him know that in his eyes he is a hero and from this day on, he is part of their family. Steph calms Max down about Boyd, after all he has been fairly level headed and smart, by giving Stu all those clues over the phone. Summer agrees, while Boyd may to dumb things, it doesn't mean he is stupid. The constant belting of food finally gets Boyd off balance and he lands with a huge thump on the ground. Travis tears into him and the two start a rumble in the dirt. Driving along a street, Stu sees some guys hanging around and then notices the white ute. He runs to the backyard. When Stu finishes breaking up the fight, Boyd asks where Steve is and then runs off. Travis is too is about to run off, but is stopped by Stu – Travis exclaims feigns his innocence. Stu tells some of Travis' mates that they should be expecting a call. He walks up to Travis, who has a bloody nose but is not saying how he got it. Stu arrests him. Lyn talks to a person on the phone about a candlestick that Oscar must have taken from the store and dumped into the trolley. She apologise and says she will bring it around tomorrow. She is startled by Jack, who's doing his laundry. Lyn sits him down and shakily says that she wants to cook him dinner and just spoil him tonight for working so hard. It's bedtime for the two hospital patients. Luka is going to sleep on the fold-out couch and David helps Lil to bed. She thanks him from the bottom of her heart…and liver. Harold and Svetlanka go to the Coffee Shop to cook some liver-friendly food leaving Serena and Luka alone. He wants some alone time, but Serena is still very jumpy and goes to get him a drink instead. Boyd privately tells Stu that although he wanted to, he did not give Travis that bloody nose. Stu says it was probably one of his mates, but it doesn't matter anyway, they have the confession recorded. The Hoyland's celebrate and thank Stu for making saving Boyd. 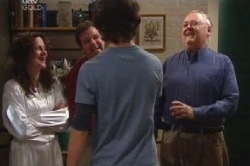 Max invites Toadie over for a drink, telling what Stu has done by he declines. Luka gulps his drink down and Serena thanks him for giving Lil's life back. He says it doesn't matter too much because she has given him herself…well not completely, not yet anyway. He tries to kiss her but she jumps away pretending his glass is in the way. Luka asks why she is treating him like some sort of stranger it is like she hates him. Serena blurts out she wants him to go home. She thought it was love, but it is just a crush. She thinks it will be better for everyone and goes to her room, visibly upset. Svetlanka exclaims that she never knew there were so many ways to cook tofu! She spent her life believing European men were the best lovers in the world, how wrong she was. On their way out, Harold hands Toadie his pizza. Stu appears and wants to know if Toadie will wait while he also gets his pizza, but the reception is just frosty. While everyone may believe Stu is a hero, he doesn't. 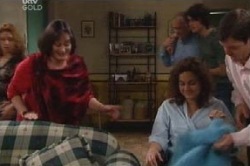 Harold puts the food in the kitchen, while Svetlanka has a chat with Luka after noticing how upset he is. He admits Serena dumped him, but is completely stumped as to why. She sighs, and while she loves her grandaughter…“Serena is fickle. She conquers a young man's heart and off she goes for another.” He doesn't believe it, but she says it's true and is not his fault. “Plenty more fish in the river”. She has something to cheer him up though in the search for his family. Svetlanka's friend from the Serbian club told her about a woman living in Canberra who is from their country and spent some time in Perth 18 years ago…and she had to give up a baby. Luka grins and thanks his godmother, she always comes good when he needs her. David serves Lil up some grilled tofu – he bets she didn't get food like this in hospital. She politely declines, opting for some fruit instead. They all notice she looks a lot better, and she does despite the bruising and just feeling tired. Luka comes in for breakfast and even accepts the grilled tofu. He tells them he found a bus for Canberra that leaves at 10 o'clock. He's going after Svetlanka told him some information about finding his real mother. Serena eyeballs Svetlanka from across the table. Lil, David and Harold can't believe he is going so soon, but he says he feels much better. Besides, he can just sleep on the bus. Svetlanka is proud that Luka is so focused. He can in, saved Liljana and continues on his quest for the search of his mother. Stu sighs to himself when he sees a picture of Sindi in the newspaper. He recognises Toadie and Travis as soon as they come into the Coffee Shop. Stu goes to have a word with Toadie, not believing that he is actually defending him! “Freedom of choice” Toadie claims. Well anyway, Stu says he is going down. Boyd has on tape to Travis admitting to the fire bomb. Before goes, Toadie, as “a friend” tells him that Travis has accused Stu of applying excessive force upon his arrest and they will be noting this in court. Max asks Steph is “anything is happening down there” as we hear Summer explaining to Boyd how the IVF treatment works. They wonder if Steph is pregnant yet, but they all don't know. The two go to get more breakfast after Max steals theirs and Summer is very loving to Boydy. Steph tells Max she wants to go spend a few days with Joe. She has only heard Lyn's side of the story and doesn't know anything about his side. She thinks it will be good for him to just air out his side of the story. Steph promises she won't get involved in their mess, but will be just there to listen. Max agrees that it will be a good idea and then talks to Steph's stomach, wanting to make sure “she” doesn't let Steph get into tractors or motor bikes. “But I love motor bikes!” “she” (Steph) replies. They agree “she” is a genius. On his way out, Stu tells Travis he knows what he's doing but he won't get away with it. He tells Toadie that it's really about him and Sindi but before they can get into that argument, Boyd and Summer walk in. They can't believe Travis is here and Stu dryly informs them Toadie is representing Mr Dean. Luka is all packed and ready to go, as Lil and David try to change his mind. He's sorry he can't, but he has got to go find his real family. Lil understands, and hopes they will catch up soon. He is a part of her after all now. Svetlanka hurries Luka out the door, but just as he is about to leave, Serena finally blurts out the truth. SERENA: This is your mother. Okay, your mother is my mother. SERENA: And you and I are brother and sister. DAVID: No no, is it true?